Jak se máš (How are you)? On behalf of the Hallettsville Chamber of Commerce and Agriculture, it is a pleasure to invite you to our 24th Annual Hallettsville Kolache Fest. This Czech-German festival will have attractions for all ages! Attractions include a car show, washer tournament, 42 domino tournament, kolache eating contest, arts & crafts booths, food booths, BBQ cookoff, carnival, 5K walk/run, and more! 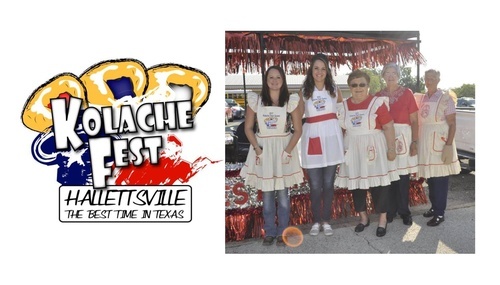 Registration forms for the 5K, car show, domino tournament, arts & crafts vendors, food vendors, and BBQ cookoff can be found at http://hallettsville.com/pages/kolachefest.html.